Following that conversation, I left completely unsure of my initial position. Perhaps I only grouped “sheng cha” (raw tea) into the heicha category for ease. We Western tea drinkers loved to compartmentalize things, and tea from China was already difficult to categorize. Concrete knowledge of tea history and production prior to the Qing dynasty was nebulous at best. 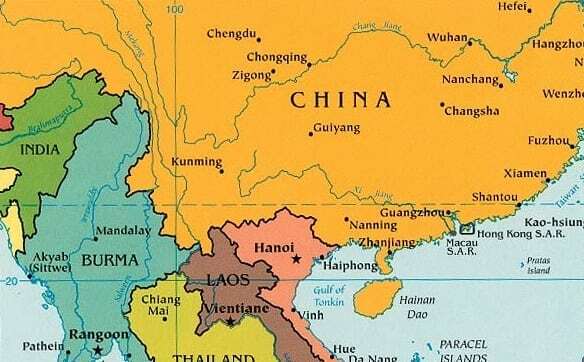 Plus, there was the issue of countries near Yunnan province, China—Thailand, Laos, Vietnam, Myanmar, Bangladesh, and the Indian states of Arunachal Pradesh and Assam. They all had indigenous tribes that produced sheng puerh-style tea from wild assamica trees. The general rule was: no tea outside of Yunnan could be considered puerh. Then what would these tribal teas be considered, if not heicha? Some had been at it for as long as the Yunnanese. My first clue came with a prior research rabbit hole I went down in April while reading Tony Gebely’s book: Tea: A User’s Guide. Through it, I learned what properties separated heicha from other teas. It was the process of fermentation; for most, the Wo Dui (or “wet-piling”) step. That being, where unfinished tea leaves (hei maocha) were placed in a warm room, piled, dolloped with moisture, covered with a tarp, and occasionally turned (or tumbled) to encourage/hastened microbial changes in the leaves themselves. Granted, not all heicha went through a Wo Dui process, but there still had to be a phase of quickened fermentation. Sheng puerh didn’t go through this process. If any microbial change took place, no evidence of it showed up for years, even decades. Shou puerh was specifically designed to mimic the long-term aging process of decades-old sheng puerh. However, anyone that’s ever tasted shou puerh could attest to them being two completely different beastly brews. 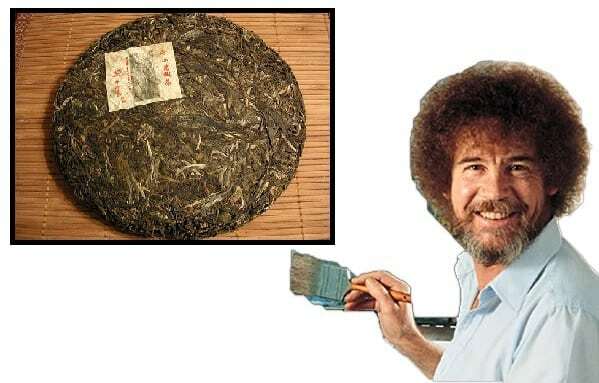 The only thing they had in common was their maocha; the original, unfinished leaf material. 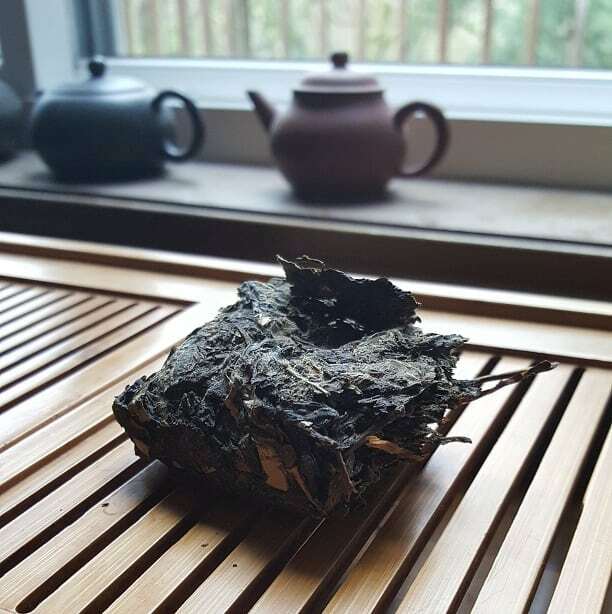 With all that in mind, I had to look at sheng puerh from a different, more scientific angle. I needed to read up on the microbial make-up of sheng puerh. Thankfully, some tea friends were able to provide some interesting (if dense) reading. It took me months to finally muster the courage to comb through it all. 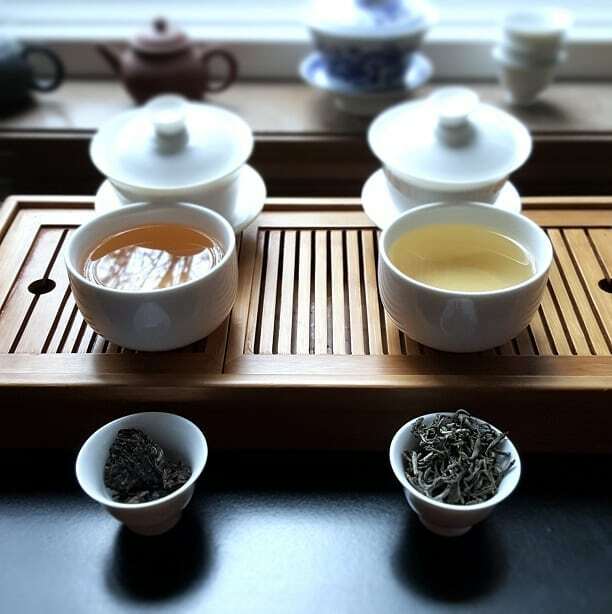 First up was an article posted by Tea Guardian, which explored the microbial changes in both sheng and shou puerh . . . but only from a health benefits angle. Second up, someone pointed out another article that focused on the fungal and bacterial microbiome found in aged sheng and shou puerh . . . but it only did so from a safety concern perspective. 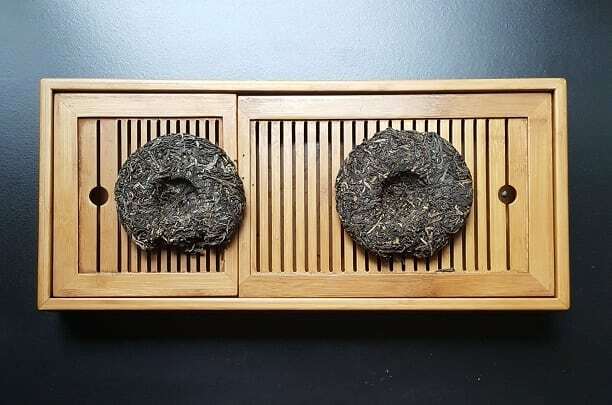 Both addressed the microbial make-up of aged sheng, but neither addressed the fermentation of sheng over time; only that the really old stuff had a similar microbial make-up as finished, wet-piled, quick-fermented puerh. Finally, I consulted my old tea friend—and budding tea scientist-sage—Eric Scott. And he . . . totally blew my investigation out of the water. 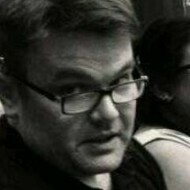 At the beginning of our conversation, he directed me to two articles he published for TeaGeek.net. They not only focused on puerh “fermentation”, but also the nomenclature behind the supposed process. Mr. Scott basically proposed that the very language we used to describe the changes occurring in puerh was wrong from a scientific standpoint. The term “oxidation” we used to describe what happened to black teas and oolongs was incorrect from a chemistry perspective. “Enzymatic browning” was more apt. “Fermentation” was also a misnomer. While wet-piled heicha did undergo a quickened microbial change, it didn’t actually “ferment”. True fermentation occurred only when certain microbes were deprived oxygen, and—as a result—had to hasten their devouring of nutrients from the plant material. The resulting byproducts? Lactic acid . . . and ethanol. Yeah . . . booze. Some true fermenting microbes made booze. The more correct term for what occurred in wet-piled tea was “microbial ripening”. Similar to what occurred to, say, brie. Compounded with that was a comment left by the venerable Austin Hodge on Eric’s article; he basically suggested that—prior to the first puerh bubble—in the early 2000s, traditional sheng puerh was difficult to find in Yunnan province. With the exception of Pu Er City, most of the teas being produced were—considered by the locals—green tea. That and, prior to 1950, the concept of such teas improving with time didn’t even enter the conversation. 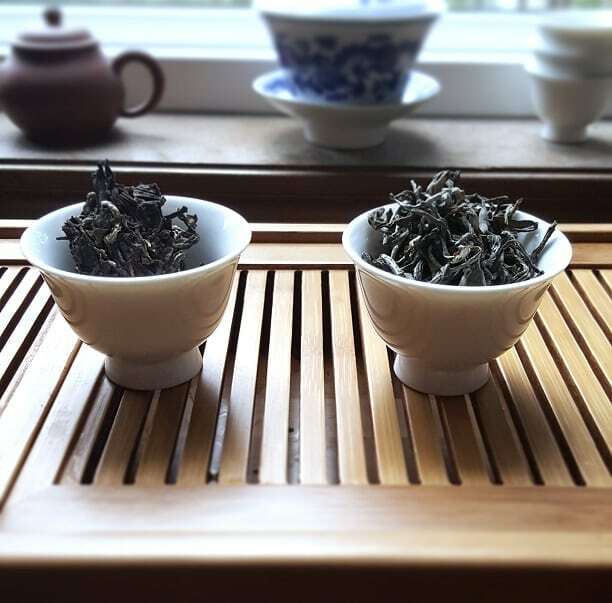 Further compounding the “heresy” was the suggestion that the aging process in sheng puerh could even be considered a special microbial change at all. The “aging” that occurred was biochemically no different than what would occur to other teas if they were stored away for long periods of time. (I.e. enzymatic browning.) 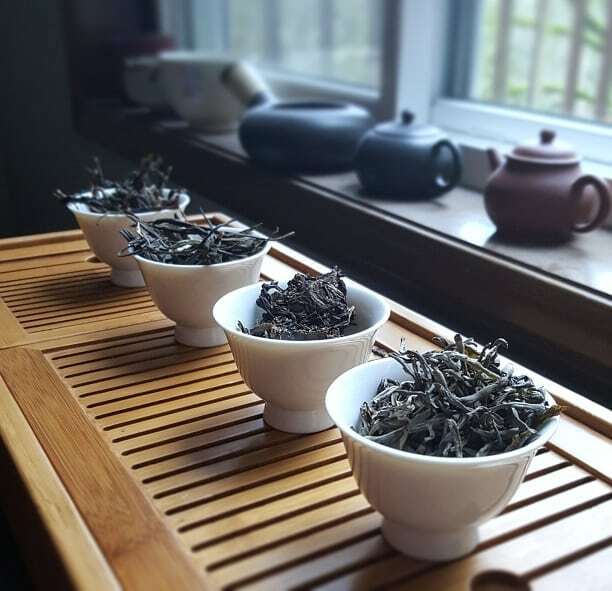 The fact that sheng cha aged with favorable results was a happy accident. In short, at this point in the quest, only one conclusion seemed viable. Sheng puerh wasn’t heicha; sheng puerh was green tea. But I couldn’t accept that. One anomaly still tugged me. If sheng cha was no different than green tea, why did it taste differently. What in the process allowed it to decay with a marked improvement in character? Most green teas went stale with age, even when stored. Sheng cha did not. The next step in my journey would have to be palatial. 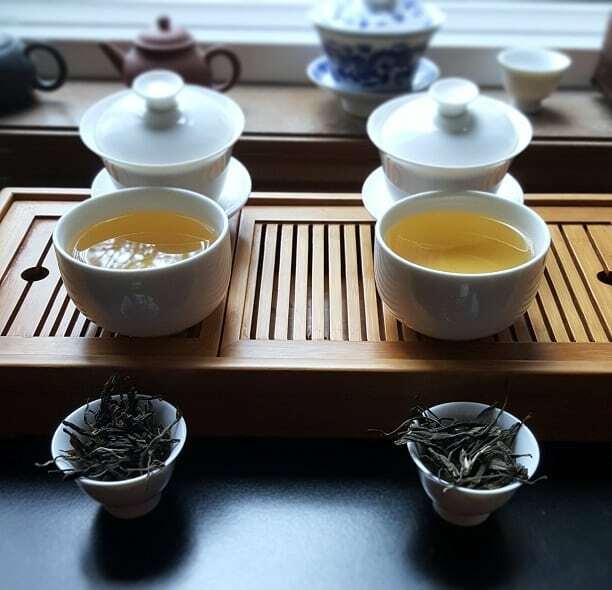 As luck would have it, the same month I began this journey, White2Tea’s May offering to their subscribers just so happened to be puerh maocha and green tea. Both were made from tea leaves grown in the same farm, processed by the same farm, in the same region—Lincang, Yunnan province, China. I needed in on that side-by-side. I contacted the head dog himself, and he willingly parted with a fair share of both the moacha and the green. During the summer, I got in contact with a tea friend (one Charles Draper), who happened to have a 2014 sheng “puerh” cake from Vietnam. Earlier discussions revealed that, while Vietnam had experimented with shou puerh for decades, attempts at sheng cha were relatively new. Charles just so happened to have a cake that hailed from Son La province in Northern Vietnam. 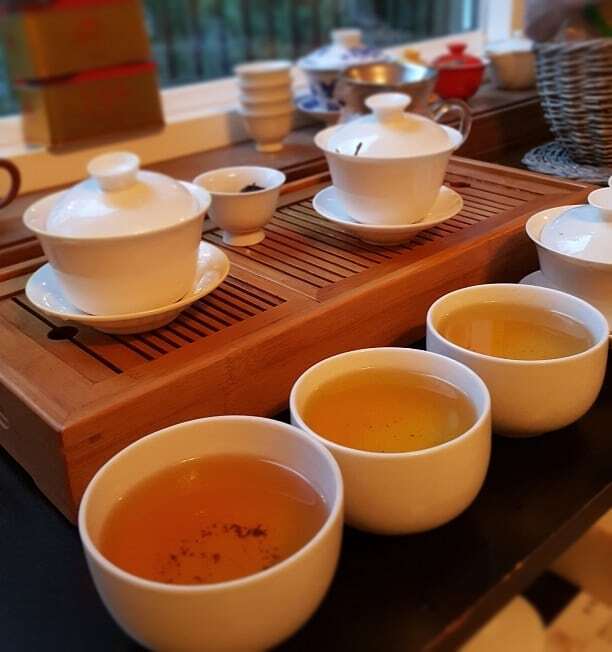 In October, on a trip to Seattle for a tea festival, my favorite puerh pundit, Jeffrey McIntosh, surprised me with another tea. A green tea also made from old assamica trees. Snow Shan green tea . . . from Vietnam! Also hailing from Son La province! With these four teas, I was set. I could, at least subjectively, differentiate between green tea and sheng cha. Over the course of one day, I did so. Left to right: Lincang sheng puerh maocha and green tea. The Lincang sheng leaves looked like typical puerh maocha to me—brown-beige-to-green, long and twisty—that the aroma they gave off was both youthfully fruity and agelessly earthy. While these were plucked and processed in 2017, they “felt” older on the nose. And, sometimes, that’s how puerh tricks ya, especially stuff from Lincang. There was a veritable elfin aromatic quality to the leaves. The green tea processed leaves had a lot in common with the moacha. The aroma was similar, if leaning more heavily on the “green” aspects—both sage-y and slightly grassy. The leaves also appeared longer, thicker, and flatter; not as twisty. And even though the color palette was similar to the moacha, the darker leaf pieces appeared really dark—fried dark. On the end, there was also a nose of salted kelp snacks. The maocha’s liquor brewed to a bold—but welcoming—amber color with a gentle, stone fruit aroma. The steam gave off echoes of moss and apricots. As for taste, it gave off a slightly bitter tickle on the forefront, conveying its youthful exuberance, but that massaged out to the fruitier notes I had hoped for. The apricot lean was even stronger in the top note, descending into a garden of cantaloupes. The finish was smooth, and not at all astringent; as one would expect in a sheng puerh so young. The green tea brewed to the same amber color as the maocha, but the aroma was far grassier; not unpleasantly so. In fact, the aroma sort of reminded me of lemongrass, although a little lighter on the citrus. Instead of apricots, yeah, I got more of a lemony lean. Either that or some other unidentified citrus fruit. The other palatial patterns were all very “green tea”-ish. I was reminded of a good, hearty Mao Feng in the top note, but the finish was as nuanced as a spring Long Jing. All the while, an earthy underpinning clung at the fringes. Left to right: Vietnamese sheng cha and Ancient Snow Shan green tea. It would be easy to confuse the “Snow Shan” material for sheng puerh on first glance. The leaves were darker than the average green; twistier, too. That and they just looked older, but that might just be from the tree stock they came from. What betrayed their green tea processing was, of course, the smell. My nose was hit by a feeling of straight grass—burnt grass—like a disgruntled cul-de-sac dad lighting his neighbor’s lawn on fire. Then poured salt over it. It wasn’t an overly offensive smell, but it was very, very . . . green tea. Full disclosure (again): prior to this write-up, I actually tried this tea a couple of other times. The first time, I straight-up hated it. I could barely swallow the last swig of it. Incredibly bitter. It wasn’t until the second go-around, at a lighter temperature, that I realized this tea’s potential. In short, I approached it like a sencha; 170F temp water, minute-long steep. 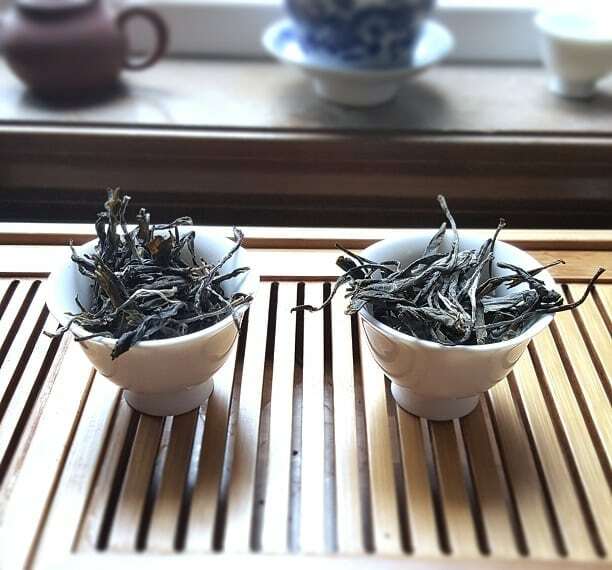 The leaves for the sheng “puerh” were tightly compressed and showed their age in the color. After about three or four years of aging, the material was dark brown with only flecks of lighter earth tones throughout. There wasn’t much of a scent to the chunks of cake, either, save for a spry earthiness and something more . . . fungal? Like a wet stored sheng would convey. That said, it was still welcoming enough to make me curious. At the same parameters, the Snow Shan green tea still came out slightly touchy. However, the results were favorable. The forefront had the sensitive bitterness of a teenage poet, but then it got up to perform after the first sip. Some astringency permeated throughout, but an earthy/stone fruit vibe dominated the crescendo and top note. Entirely different from any other green tea I’ve had (save for the other green from puerh material I had earlier). One could taste the ancient lineage of the leaf itself . . . but if over-brewed, it would have shades of “tea retirement home” on the aftertaste. When brewed delicately, this had quite the story to tell. The liquor brewed up far darker than I thought it would. Instead of the soft amber I was expecting, it colored to a burly rust-amber, bordering on copper. Yep, this definitely had some age to it. The steam aroma was equal parts toasty and stone fruity. As in, fruit that actually grew out of a stone, not from a wussy-arse tree. Taste-wise? . . . I was floored. That same toastiness blanketed the palate from first sip to finish. A feeling of ancient citrus fruit enveloped my tongue, like an essence of . . . immortal zest? A medicinal toastiness took point in the middle, reminding me of a caked white tea with five years of storage to its name. All the while, the thing that surprised me the most was how full-bodied it remained throughout. Further infusions turned up similar results; it didn’t weaken at all until about the fourth or fifth infusion. Several hours and a lot of caffeine later, I had reached a verdict. Sheng cha wasn’t heicha . . . but it wasn’t green tea, either. It was something entirely different. Part of that categorical distinction lay in the process. Enzymatic browning occurred in tea leaves after the cellular walls were broken, and polyphenol oxidase intermingled with catechins within the leaf. The resulting chemical meet-cute caused the leaf to die off. A process called shaqing (or “kill-green”) prevented this die-off from occurring in green tea. This was administered many different ways. In China, oftentimes tea leaves were traditionally pan-fired. In Japan, most leaves were steamed. In India and Sri Lanka, tea leaves were put in ovens. It didn’t matter how, but a tremendous amount of heat had to be applied to the leaf, thus arresting the cellular die-off. For sheng cha, the process was markedly different. Heat was applied (through pan-firing or other means), but at a far lower temperature and—in some cases—for a far shorter period of time. After that, they were sun-dried. As a result, some enzymatic browning could still occur, even after the moacha was processed. What does that all mean? It means that sheng cha should be its own category. I made this declaration before in an article I posted in the summer of 2017. But back then, it was just a hypothesis. I hadn’t yet tasted the difference between sheng cha and green tea from similar leaf material. Now I have, twice over, and my conscience is clear. Is this a conclusion other, more learned tea professionals will come to? Will there finally be a study conducted determining exactly how and why sheng cha ages the way it does? And if so, will the terminology change along with it? Like a properly stored sheng cha cake . . . time will tell. An informative article on a very specific subject. What else could I expect from you? I just pictured you singing a duo with Lazyliteratus on heicha/sheng cha. Fermentation is a broad term that refers to bacterial and yeast breakdown of organic material with the application of heat. In the case of puerh tea, the end result is plant juices converted to sugars. In the case of fermentation of fruit for wine or other alcohol, the sugars are the starting point and the end result is alcohol. Fermentation is still a correct term. Microbiologically? Eh … there’s cause for debate. Fermentation may be the term applied by those who didn’t appreciate it’s true meaning, so i think you are correct in saying it is not fermentation, but will probably stir up a firestorm and be no more successful than Kleenex in trying to reclaim their brand identity. Oh, I know. It was just an interesting thought experiment. We settled on “fermentation” as a term for a wholly Chinese process. Language is fluid; science ain’t … until it is.